In my pre-motherhood days, I thought these were just the sentimental musings of people who were either being dramatic or who couldn’t think of anything else to say and so they just made the token grandparent statements they’d heard other people make. But that was just my hormones talking; if I was being more honest with myself and less prideful, I knew what she meant and that her intentions were only to help me. Well…now, I’m the one making these statements. Because, while I’m far from being a grandparent, I totally “get” it. “Babies don’t keep” isn’t some figurative thought that sounds good in a poem. A year used to be the amount of time it took me to get from one Christmas to the next. Now, it means that my infant has gone through at least three sizes of clothing and has grown teeth, a personality and the ability to communicate. It means that my toddler has gone from eating markers to making works of art with them. It means that my preschooler has gone from talking super cute to talking super normal, perfectly pronouncing “r’s” and “l’s” and correctly using pronouns. It means that my 1st grader has gone from sincerely asking if we could go to Little Bear’s house for a visit to requesting anything other than “Little Bear” when we turn on the television. A year in a child’s life might be 365 days, but those 365 days are crammed full of growing and shifting and changing. And what about four years? Four years used to measure the amount of time it took to get through high school. Now, four years means I can go from a world completely immersed in “all things baby” to a world completely devoid of cribs, playpens, highchairs, bottles, diapers, onesies, and strollers. If that thought is one part wonderful, it is three parts terrible! blink, and you really might miss it. everytime I look at a picture from last year and feel the floor drop out from under my feet because they’ve changed SO much and I didn’t even see it happen. Motherhood, itself, is so full of change and growth and bewilderment, and it can be exceedingly difficult to grasp these things in the moment; young pups like us are sadly gifted at getting everything flipped upside down. We have to shuttle the kids around like this because we have to get “this” done because “this” is so important. We have to feel the burden of the mess and the clutter and we can’t rest until it is cleaned up! We need to get this project – that we voluntarily invented – completed NOW. Today. Without delay. Before we run out of time! But I’m looking around at my life, and the only thing that truly has a deadline around here are these four little humans that are getting taller every minute. If childhood is literally short, there comes with it an expiration date. Nursery rhymes. I want to read them every day until we can recite them in our sleep. Silly songs and lullabies. I used to dream of the day when I could enjoy my favorite vintage kid songs with my children, but now that I’m in the midst of the perfect season, I’m too busy sometimes to even pull up the playlists. Looking at the stars. Night after night, the sun goes down and a masterpiece lights up the sky, and all I want to do is put them to bed and watch a stupid TV show. Cuddles. I want to curl up to them as often as they want me to, and then for ten minutes more. I want to feast on ALL of it while my table is brimming with childhood. And I want to read to them every day until my throat hurts. Lord willing, they’ll all still be here when the “blink” is over, and I can pursue them until my face is rosy. But for now, I have some advice to heed. “Don’t blink or you’ll miss it”? I am so honored to be among the “freshly pressed” with this blog post! Thank you for all of the kind words, reblogs and likes. 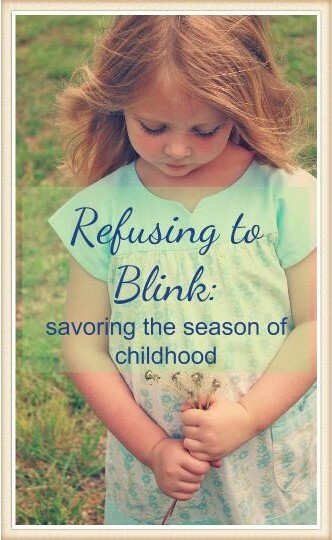 As I am “refusing to blink” and can spare no extra time with my back to these precious kids of mine, I am unable to respond to comments during this season of my life. But your words are dear to me. Thank you so much! I’m a pretty modest person. And I cannot for the LIFE of me dig up enough maturity to use scientific terms for body parts and bodily functions. Which explains why my husband says he sometimes felt like someone was going to come and arrest him for taking advantage of me when they saw that I was with child and then heard me try to answer medical questions without squirming like a 12-year old and using phrases like “a #2” instead of “a bowel movement”. By the way, if you could have seen me at the hospital trying to discuss our plan for birth control with a wet-behind-the-ears and adorably awkward medical student, you would have been in stitches. I’m just so glad my husband was asleep at the time with ear-plugs in his ears. And so having a curious little boy named Gideon in my life has posed a bit of a challenge to me, especially after an extremely awkward encounter we had when he was only two years old. I would tell you the story, but…I can’t. There are no words. “I’m good, Gid!” I would insist, thanking him for his help as I retreated with my belly to a safer part of the house. I looked at Mr. Gore. “I’m going to have to tell them,” I said. I knew, with our new family dynamic and our busy homeschooling schedule, that I couldn’t just hide out in my room for a year, nor could I carry Shepherd around under a blanket every 3 hours without them thinking I was a little off-my-rocker. But, as Betsie would say, I was “skerred”. I had no idea how Gideon was going to react to what I told him. Would he gag? Would he crack up? Would he be mortified and flee from my presence? I decided to give myself a head-start by talking to Rebekah first. Her calm acceptance of how I look in my birthday suit gave me confidence to know this wouldn’t be a big deal to her. During one of the baby’s feedings, she joined me on my bed; the baby was completely hidden by covers. She nodded her head, eyes alight with curiosity. I told her. (That’s gonna be a negative, Ghost Rider). So now it was Gideon’s turn. His Papa had already helped me out by telling him that the baby was getting his nourishment “from Mama”, but that wasn’t enough for Gid the Kid. He happily obliged, bouncing down beside me in his usual rough-and-tumble manner. “Is he eating right now?” he asked, immediately, confirming my assumption that if I could get him to my room while I was nursing, he would naturally initiate the conversation. I nodded, and my stomach started clenching up as I anticipated what was ahead. “How is he eating?…” he asked. “He just is…” I hedged, trying to find the right words. But before I could stop him, Gideon peeked under the blanket. and then my favorite goofy, crooked, top-front-toothless grin spread across his face. “Really? !” he exclaimed, smiling hugely. “Cool.” he said lightly, as if his mom being a walking milk-truck was the most natural and awesome thing in the world. I heaved a giant sigh of relief, and we started reading his book. Why in the world had I waited SO long to let him in on this great mystery and miracle of life? Not so fast, Mrs. Gore. We still had one more “talk” ahead. Later that day, when I was feeding Shepherd yet again, Gideon joined me on my bed, a giant question written all over his face. “So…where is the milk at?” he asked, obviously confused. It was obvious that I was going to have to GROW UP and be a little less vague. I couldn’t bring myself to show him the exact source of Shepherd’s nourishment, and so in an impromptu stroke of genius, I lifted up his shirt. “See those things right there?” I asked, bluntly. “That’s where it comes from,” I said, boldly and without hesitation. The question mark on his face was replaced with a lightbulb. “Yeah, to the milk,” he explained. You have no idea how happy I was, one, that our conversation about breastfeeding was finally over, two, that Gideon had given me a funny story to tell, and, three, that I now had a great word to use when referring to…you know. Those things. I just wanna ramble instead. I have several friends who are pregnant with their first babies, and two in particular who are home right now with their newly hatched chicks, and my heart is just so full of happiness and hope for them, for nothing can change a gal like motherhood can. God has used my children to sanctify me, to grow me up, to deeply challenge me…and it has all happened so quickly. 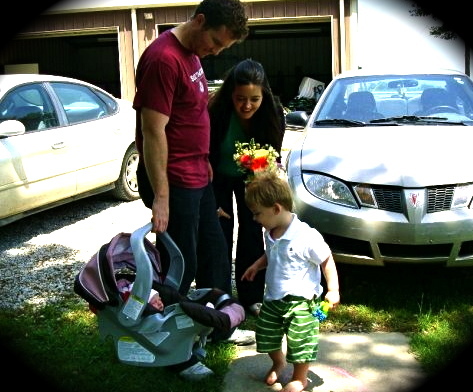 I identify less and less with the woman-child of 5 years ago – I’ll admit, she was cute (what?! she was! ), but she was pretty selfish and immature and self-absorbed – now, however, my feet have been set firmly on a journey that daily takes me further away from “ME” and draws me nearer and closer to the heart of God. Its a Christmas miracle, everybody. But…back to you. (See? I’m not self-absorbed anymore! I’m thinking of others). There is really nothing like that first drive home from the hospital with a newborn infant in your backseat. You will probably feel very tentative and unsure, like “Uhhh…is it really okay that we are in charge of this human? Are the hospital police going to pull us over soon and make us go back?” I don’t care if you are the eldest Duggar child and have been around babies your entire life, this drive from hospital to home is B.I.G., monumental in its implications, a rite of passage like no other. And truly, the world just looks completely different on the way home, as if you’ve landed on a different planet. While we were at the hospital with Gideon, spring had sprung and I just could not stop staring out my window on our drive home, trying to find some level of familiarity with what I was seeing (when I wasn’t bent over the backseat to make sure he was still breathing, that is). Sometimes the trip home from the hospital can be rather entertaining. As we squired our latest squirt home in May, I was surprised and alarmed to have my hormones crash right before our eyes, resulting in a very curious dosey-doe of laughing and crying. I would get tickled at something and laugh hysterically and then I would just burst into tears, all as Mr. Gore held up his fingers to keep count of how many times I cried on the way home. Seven times. I do have one very strong word of advice for new parents: Give yourself some time – at least a month – to adjust to your “new normal”. The old normal…the one where you sleep when you want to sleep, the one where you are on top of things and know where everything in your house is, the one where you can have an intelligent conversation with your peers…is gone. So for at least one month, I forbid you to feel any guilt over your falling-apart house. I forbid you to feel ugly or fat. I forbid you to think that what you are experiencing now will continue for the rest of your life. Look at me, dear one…it won’t. One month. It simply isn’t fair to have any expectations until that first month is past. (And some of you may need two or three. No one is judging you here, Pokey Little Puppy). Just hunker down with your new little love, learn to feed it, memorize its face, and linger over every moment you have together. These days will be gracious for you and will stand still. Far too soon, the days of the calendar will fall with more and more rapidity, and that child in your arms that seems to develop like the slow little tortoise will become like that swift hare, racing through life while you try to catch its slippery foot lest your heart break from the loss…I’m sorry, was that depressing? I digress. Likewise, do not despair over your lack of sleep in the first weeks (and/or months). This is a short season of life, I promise, and as I have told many a young mother (okay, maybe 3 or 4), you will feel like you are going to go off-the-charts insane from your sleepless night-after-night-after-night, and then, one night you’ll go to sleep, exhausted as is the norm, and wake up…in the morning. With no sleep interruptions. No middle-of-the-night feedings. And guess what? This trend will continue, night after night after night. 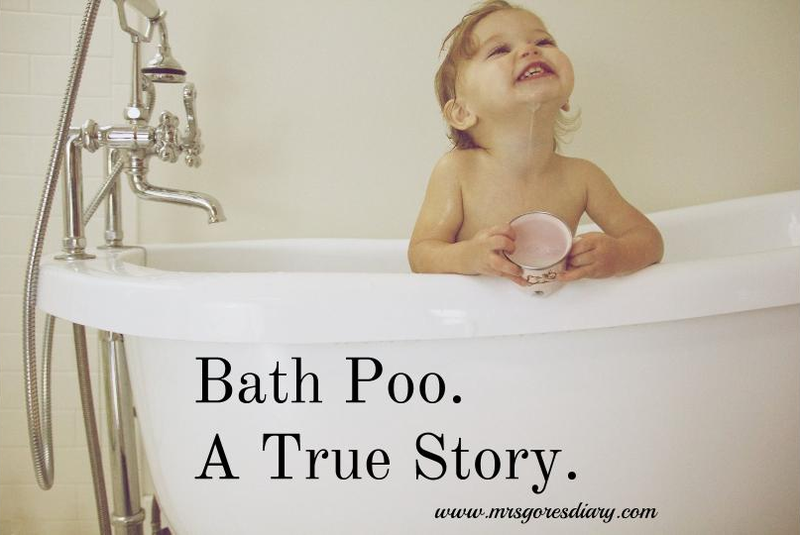 Until your kid gets sick for the first time and throws up on you seven times before daybreak – but that’s another post altogether, I think. It is just far too easy to be hard on yourself, especially the first time around. So take Mrs. Gore at her word and for this first couple of months, putter about the house in your wrinkled, spat-up-upon nightdress, feed your husband cereal, sleep whenever your baby sleeps, flush your self-imposed deadlines down the toilet, and sing peace, and love and contentment upon your baby. This is your hour. You and baby. Baby and you. An irreplaceable, sweeter-than-sweet, quiet and still communion. Relish it, please. Unless your baby has colic. In which case, I can’t help you and you should probably start looking for a blog for mothers of colicky babies. Which leads me to encourage you in this – don’t be a bit afraid to accept some help and support. I sincerely don’t know how anyone survives parenting small children without a little bit of help now and then – when my husband fills up the dishwasher without being asked or when my Mom drops in and takes a bag of laundry home or when my friend stops by with some warm peach crisp, I just want to weep with gratitude – those seemingly small gestures do wonders to reset my attitude and allow me the opportunity to get back on top of things again. Thus, if someone says to you “What can I do to help you?” don’t you dare say “Oh, we’re fine!” Instead, try saying “We’re STARVING – could you bring us some supper?” or “Would you mind picking me up some powdered donuts when you do your shopping?” or “Could you sit with the baby while I take a shower this morning?” They wouldn’t ask if they didn’t really want to help; if not, you’ll teach them not to ask unless they plan on following through. Either way, you win. And then there is one more “new normal” to grow adjusted to. You might have been a stalwart believer in the sovereignty of God before you had your baby…and in your heart, you still are…but mortality might be weighing quite heavily upon your mind in the months to come. I don’t know what it is – the hormones? The first-hand experience of the miracle of birth? The responsibility of bringing up a human being all by yourself? Whatever it is, your heart will very likely go through the ringer of anxiety and fear over the idea of something happening to your little one or even yourself…life and its frailty is so obvious in an infant and I just encourage you to use your fresh eyes to see anew the true purpose of your stay on earth – to glorify God and enjoy Him forever – and to learn all over again what it means to trust Him and His good plan for your life. Guess what? He loves your baby even more than you do. I’m sure there are many other things I could tell you – I honestly don’t know if this was very helpful at all, or if it was just a good night to ramble – but I hope it encourages those of you who are in the fog of infancy, and prepares those who are still incubating for what lies ahead. Regardless, I wish you and baby the very best. God bless you in your new life together! I wouldn’t yet compare myself to Michelle Duggar when it comes to birthin’ babies, but after popping out an infant once every two years since 2007, this ain’t my first rodeo. (I’ve been wanting to say that for a long time…it wasn’t as gratifying as I thought it would be). And so, young mothers, I thought it important to share with you the knowledge I have gleaned about how to survive – and thrive! – during your hospital (I’m about to make up yet another “vacation” word!) lay-cation, separated into 3 easy-to-follow phases. Today we will review Phase 1, “the packing phase,” which will include the literal packing of your suitcase, as well as tips for how to arrive at the hospital in an organized and peaceful state of mind. Let us begin. * Don’t be a dummy about this. To fashionably survive at the hospital takes some major preparation, and since you don’t really know when or where you will go into labor, you need to start planning and packing well before your due date. * Purchase a sweet new nightgown (at a real people store, not a maternity one) – with buttons in the front if you’re planning to nurse – and hang it in your closet. Every time a lady has a baby she deserves to come home to a clean, fresh, pretty nightgown. Do not take it to the hospital. I did this on my first go-round and was surprised that my hospital room was more like a busy dorm room than a private hotel room. Believe me, you won’t feel comfortable hanging out with your doctor and your relatives in your lacy little gown and robe. Pants are a much better choice, especially when you are awkwardly and painfully crawling in and out of your hospital bed. a good book that you’ve never read before – it’s wise to have a good distraction on hand should you have a scheduled delivery, as a “schedule” at a hospital is tentative indeed (and for good reason – emergencies always trump plain ol’ inducements, and rightly so). If you are not a reader, bring a portable DVD player and some favorite movies or playing cards or your I-pod…you get the drift. Travel-size bottles and packages of all your favorite toiletries. Buy as much of your bedtime and morning routine products as possible ahead of time and have them packed in your suitcase, along with a list of what you will need to throw in at the last minute, i.e. glasses, curling iron, etc. The benefits of doing this ensure that you will not pack in haste and wind up at the hospital without your favorite moisturizer, plus you can just dispose of all those travel-size products before you leave the hospital and not worry about unpacking a million things when you get home. Everything will be where you left it in your bathroom and you can head straight to your shower without rifling through your suitcase first. A bottle of HPA Lanolin and a few nursing pads. I didn’t know the need for things like this existed, but a sweet lady brought me a care package to the hospital that included both. Trust me, you’ll need them. A pair of slippers, a pair of flip flops (for the shower), and two or three pairs of socks. Clean or not, it feels gross to walk barefoot on hospital tile floors. Packages of your favorite gum and candy, as well as your husband’s. Cash for the vending machine…if you’re lucky like I was, your local hospital vending machine might just surprise you with the first package of Hostess Dunkin’ Sticks that you’ve seen for YEARS, at just $1 a package. So you’re going to need at least $6. A blanket for baby. This should also be a keepsake. I’m of the mind that each baby should have at least one special blanket that was not handed down from brother or sister. What to Expect When You’re Expecting. It really does answer all of your questions, and you’re going to have lots of them, even after reading this most-helpful blog post. A decent going home outfit. Keep comfort in mind here, too – your body is going to be a little out of whack – but also know that you might find yourself in several photographs on this day. You’ll regret it if you dress like a cotton headed ninny muggins. Camera, camera charger, video camera, video camera charger, uploading cord and laptop. Because people want to see pictures of the baby the minute it lands in the doctor’s hands, and you really shouldn’t keep your public waiting. Or you might have one of those new-fangled telephones that can take pictures and send them to the “internets”. So take that thing and whatever you need to make it work. A carseat. You can’t leave the hospital without it. Your own pillows, if you are particular about things like that. I take 3 feather pillows – two for me, one for Mr. Gore. He always protests until he sees the plastic couch that will be his home for 2 nights, and then, he says “Thank you, Mrs. Gore.” Well…in my head he does. The last of your toiletries…make-up, corrective vision stuff, toothbrush, razor…whatever you need to make the hospital feel like home and to ensure that you look semi-dazzlingly beautiful in all your pictures. A box of animal cookies for each child, and other packages of treats like raisins or fruit snacks. It will give them something to sit down with for a bit when they come to visit you and see their new sibling, and they’ll see that Mama is still caring for them, even as a hospital patient. When children come to a hospital room, the room shrinks fast. They will most certainly need a distraction, and nothing works better than food. A couple of movies, just in case they are stuck in the waiting room with their grandparents while you are having the baby. You can lend them the portable DVD player that you packed for yourself. *You will also need to make sure your husband packs his bag. It doesn’t really matter as much what he brings…like your wedding day, no one really will notice he is even there. But he will need day clothes and something comfortable and modest to sleep in. He also will need books, magazines and the like. It’s your job to tell him this or else he’ll be bored in your room and talk to you, interrupting your perusal of In Style. *That’s a lot of stuff, isn’t it? And it’s very important that you pack it well, in as small a suitcase as possible. The nurses don’t want to be tripping over your bags and you will not enjoy carrying armfuls of stuff or having your husband go back and forth to the car, which could possibly be 1/2 mile away from your hospital room. * Birthing classes are profitable with pregnancy #1, plus they are so hilarious and awkward. You should go. *Take advantage of the supernatural nesting phase by cleaning and organizing every last corner of your house. You will not have the time or the energy when you get back home, and frankly, you won’t really care anymore about the junk in your filing cabinet or the dust behind your entertainment armoire. This is a once-a-pregnancy opportunity – don’t miss it! *Pray for your child. When you feel worrisome about what is ahead or have a sudden urge to panic, place your thoughts instead on your sweet baby and lift him/her up to God. Your health and the health of your baby is very important and prayer-worthy, but bundled up in that tiny little baby’s body is an eternal soul that, more than anything, needs the grace and mercy of God – this should always be the focus of your prayers. Nothing is more urgent or important. *Pre-register at your hospital, if possible. Then you won’t have to fill out pages of paperwork when you come in to have the baby. *Eat. Eat all you want. A whole watermelon…6 slices of bacon…a sandwich and chips at midnight…these last months of pregnancy are your last hoorah! Enjoy it. But don’t tell your doctor I said so. Holy smokes! I’m exhausted now….so how about we all go take a nap? Which is the last (and mega-important) step to fashionably surviving at the hospital. Get your sleep, Mama. You don’t want to arrive at the hospital on the wrong side of the bed! Any other words of packing advice from our experienced hospital laycationers? Did I forget anything? Leave your comments below. And stay tuned, pregnant ladies…phases 2 and 3 will be posted in the days and weeks to come! 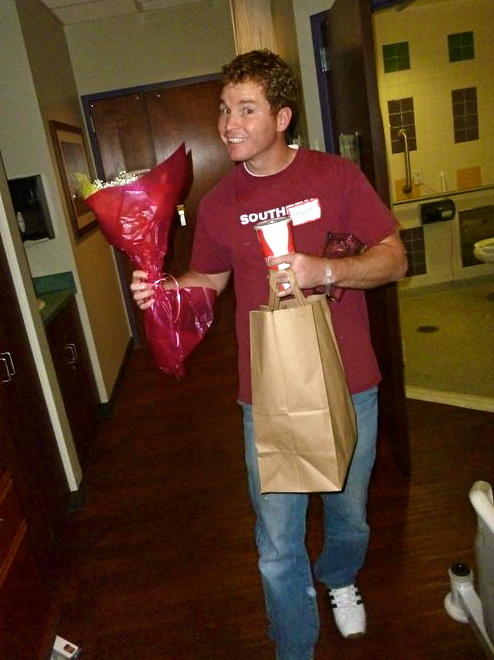 I delivered a baby; Mr. Gore delivered flowers, Dr. Pepper and key lime pie.